The long-anticipated Chilcot inquiry report was released today. It chronicled British government decisions leading to the invasion of Iraq in 2003. The key points of the report state that Tony Blair and his close circle of advisors misled the public and failed to prepare for the consequences of invasion and occupation. The continuation of this strategic goal explains the strong emphasis elsewhere in the document and in other Pentagon planning on using military force, if necessary, to prevent the proliferation of nuclear weapons and other weapons of mass destruction in such countries as North Korea, Iraq, some of the successor republics to the Soviet Union and in Europe. Nuclear proliferation, if unchecked by superpower action, could tempt Germany, Japan and other industrial powers to acquire nuclear weapons to deter attack from regional foes. This could start them down the road to global competition with the United States and, in a crisis over national interests, military rivalry. In the Middle East and Southwest Asia, our overall objective is to remain the predominant outside power in the region and preserve U.S. and Western access to the region’s oil. We also seek to deter further aggression in the region, foster regional stability, protect U.S. nationals and property, and safeguard our access to international air and seaways. As demonstrated by Iraq’s invasion of Kuwait, it remains fundamentally important to prevent a hegemon or alignment of powers from dominating the region. This pertains especially to the Arabian peninsula. Therefore, we must continue to play a role through enhanced deterrence and improved cooperative security. While neoconservatives often talk about acting alone if necessary, their actions need collaborators to provide legitimacy and deflect accusations of American imperialism. Tony Blair and the British government, every step of the way, were willing to back the entire operation. Without vigorous British support, there would likely have been fewer European nations involved. As is, no country other than the US and UK provided more than a few thousand soldiers at any one time- Italy had the third-largest number of soldiers killed, with just 33. The Chilcot report says that Blair told President Bush “I will be with you, whatever” in July 2002– over half a year before the invasion itself, while both countries ostensibly supported peaceful diplomatic means with regard to purported WMDs in Iraq. Four different questions were asked by pollster MORI before the invasion in 2003- with the question assuming no UN Security Council support and no UN evidence of weapons of mass destruction (the historical reality) having almost 70% opposed. Most of the largest anti-war marches were in Europe, including a massive march in London featuring address by Labour backbencher Jeremy Corbyn, who would take Blair’s job as party leader twelve years later (making Blair turn blue in rage). Since Blair left office, the consequences of his decision to back invasion on tenuous pretenses continue to mount. Not only were none of the goals of the invasion met, but the rise of ISIS was built on the UK’s invasion of northern Iraq and the subsequent disbandment of the Republican Guard. Two car bombings this week add onto a large civilian death toll (at the very least 165,000). I don’t know what the counterfactual is- would there still be an Iraq War, an insurgency, and an ISIS if the United Kingdom had turned President Bush down? The Chilcot report only documents that Blair decided on invasion, no matter the circumstances. And even if it wasn’t originally their idea, his circle supported it just as fervently as America. War brings people together. War gets dissenters thrown in prison. 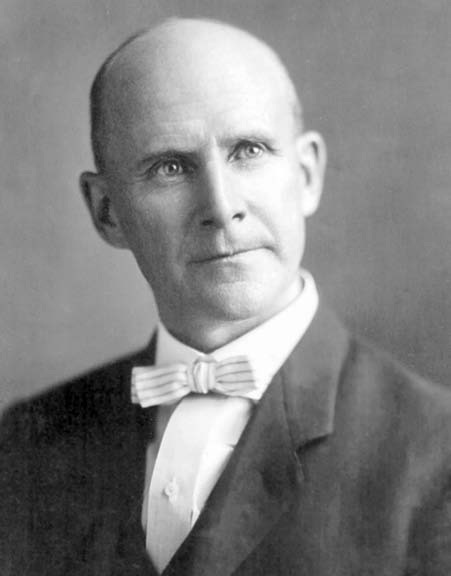 Eugene V. Debs- socialist, labor organizers, snappy dresser, jailed for opposing World War I. What it comes down to is that there are two sides to any event, like a war or a terrorist attack, which rallies people together. There is union, but also violence and repression to those that are in the wrong place (or of the wrong race, or nationality) at the wrong time. Triumph over Nazi Germany and imperial Japan gets so much romanticism, but for 100,000+ Japanese-Americans who were herded into camps, they suffered because of the drive to war. Intellectuals of both liberal and conservative background have often welcomed war as an engine for social good, but as Randolph Bourne thought, “using war powers to achieve domestic reform is like using a firehose to fill a water glass”. Social solidarity in wartime comes with special symptoms: jingoism, inflexibility, and mob sanction. 1917 wasn’t just about giving the Kaiser a good licking, it was about government-led oppression against trade unionists, socialists, and anyone who opposed the war. That legacy remains with us- Edward Snowden, should he end up in US custody, would face charges under the Espionage Act of 1917, which doesn’t even allow him any kind of legal defense. Any justification, no matter how good, is irrelevant. That was the dark mentality of America at the time. You’re with us, or against us. No extenuating circumstances, no middle ground. Author Andrew MackayPosted on July 7, 2014 Categories History, National security, ProtestTags anti-war, edward snowden, eugene v debs, free speech, history, Japanese internment, jingoism, patriotism, protest, union, war, world war ILeave a comment on War brings people together. War gets dissenters thrown in prison. Last Tuesday, Bradley Manning, the soldier who leaked documents about the US wars in Afghanistan and Iraq, was found guilty of 17 different counts in a military tribunal. Several charges came from the Espionage Act of 1917, which traditionally covered spying rather than leaking of this type (to the media rather than enemy states). Pictured is a 1922 protest against the Espionage Act, which had been used against many anti-war leftists- who these protestors considered political prisoners. Author Andrew MackayPosted on August 4, 2013 Format ImageCategories UncategorizedTags anti-war, espionage act, leak, leftist, manning, socialismLeave a comment on Is it espionage? Pictured is a protest against US involvement in Vietnam, it occurred in Berkeley, CA in December 1965. The first thing that came to mind was Mad Men. Well-dressed people with the distinctive design of the early 1960s. While famous Vietnam protest photos show the student revolt and the rise of counterculture, there were opponents early on. In 1965 the war had about a 60% approval rating, but there were still large protests. Opposition to Vietnam may be crystallized in the American conscious as Kent State, days of rage, and the hippies, but it was inaugurated by people who wouldn’t look out of place in Leave It to Beaver.